I have been searching for a good recipe of Pide for a while now. 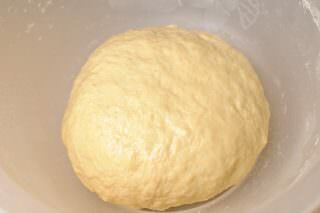 The main issue for me was the dough – it is somewhat pizza-like. The dough should be chewy and very soft. I tried making it once, but it didn’t come out as good and it was not as chewy as I would want it to be. Plus, it is very hard for my children to nibble on something hard. Patience indeed is a virtue. My search of the ideal dough recipe for Pide ended today. 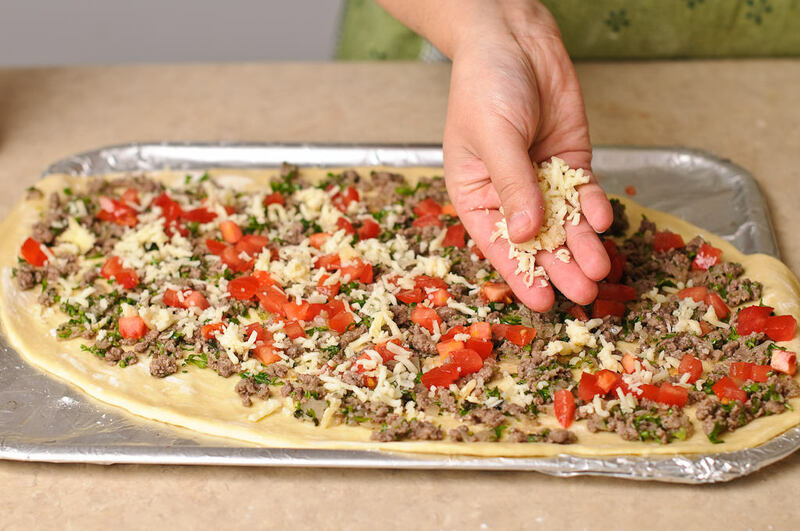 A Russian lady in one of the online communities I am member of, graciously shared her recipe of Pide. I quickly adopted a part of her recipe, which helped me to recreate that exact Pide I ate years ago in a Turkish restaurant. I put together a combination of toppings we like and decided to share it with you. 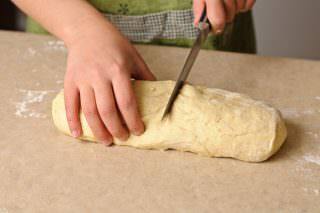 In Turkey, every region has its own way of making Pide. 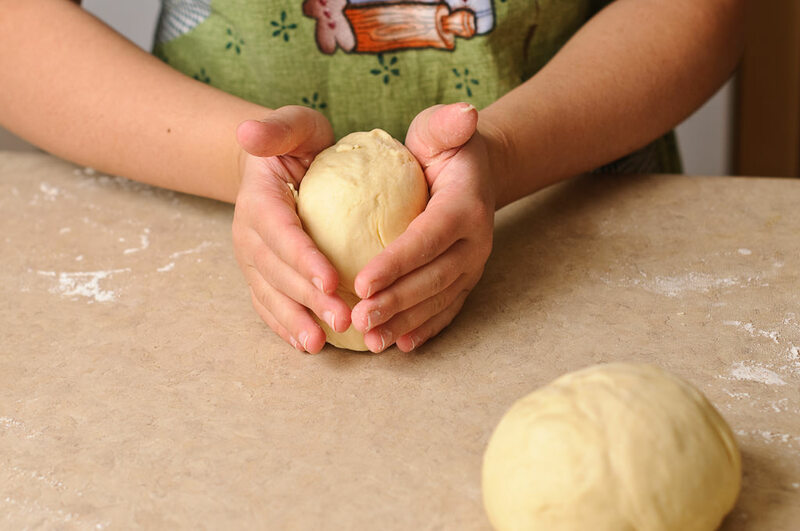 The dough mainly remains the same, but the toppings vary. 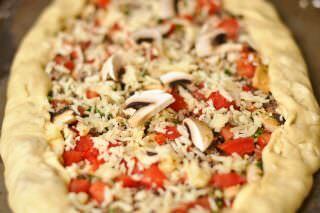 The topping that I am going to use, is the most appealingÂ to me and is altered according to the taste of my family. 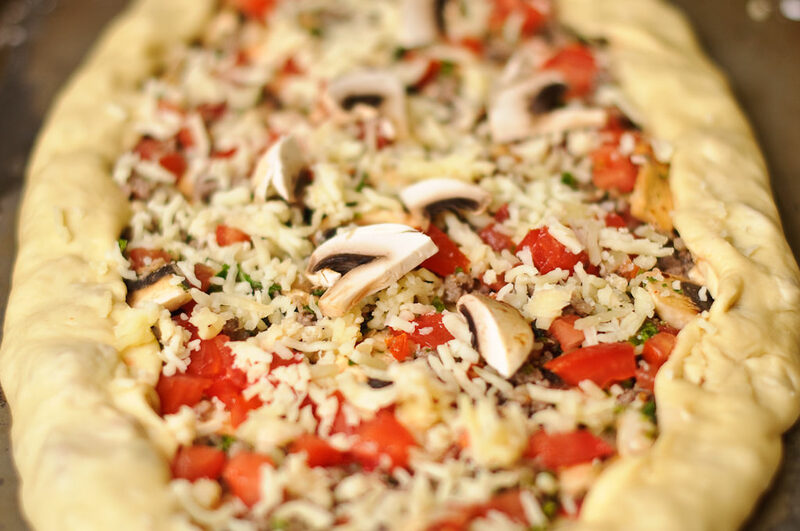 You can most definitely try your own topping combination. It could be veggies, just cheese, sausage, etc. It is not as time consuming as it may seem. 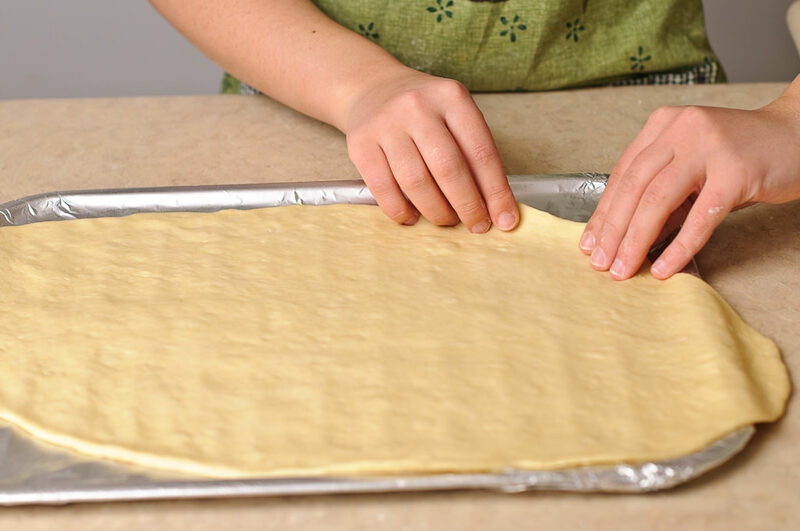 It will take you less than an hour to put it together, bake and serve. Make sure that the milk is really warm. 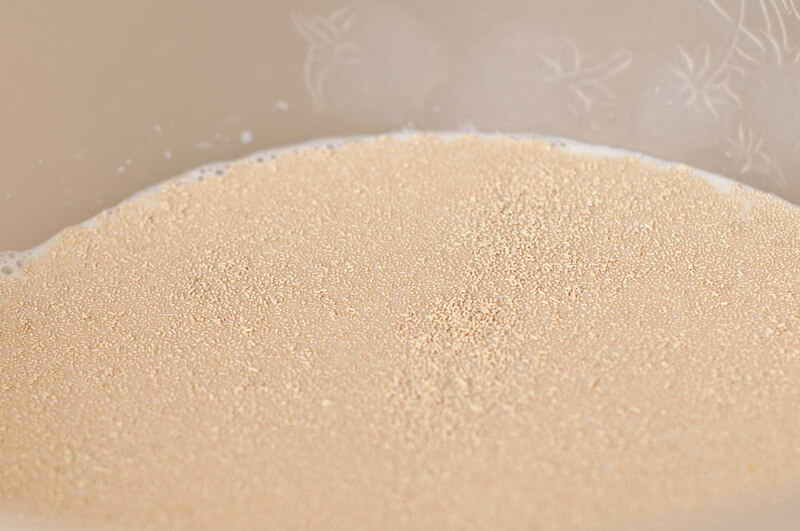 Put the milk in a medium size bowl, dissolve the yeast in the milk, add the egg, sugar, salt, and oil. 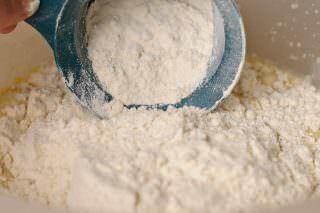 Mix everything well and add the flour. Kneed a nice, smooth and springy dough.Â I precisely measured the amount of flour needed. I hope you will not need more. But if you do, add 1/2 cup or less. 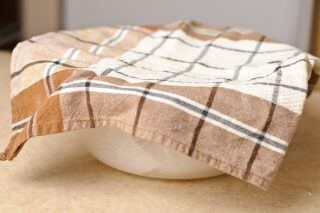 Grease the dough with just a little bit of oil, put a damp cloth over it and cover with another towel. 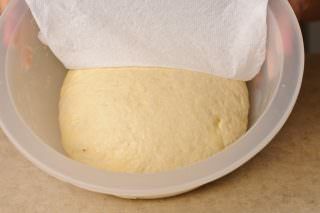 Let the dough rest for 30 minutes. 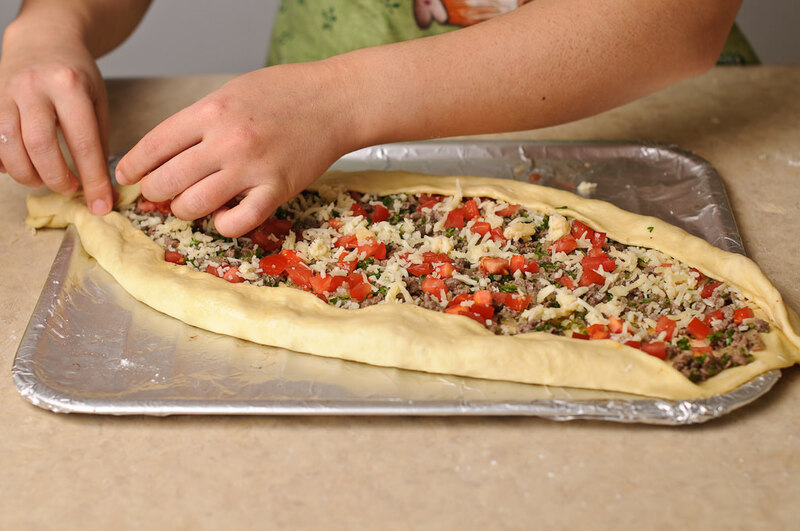 While the dough is resting, prepare the topping for Pide. 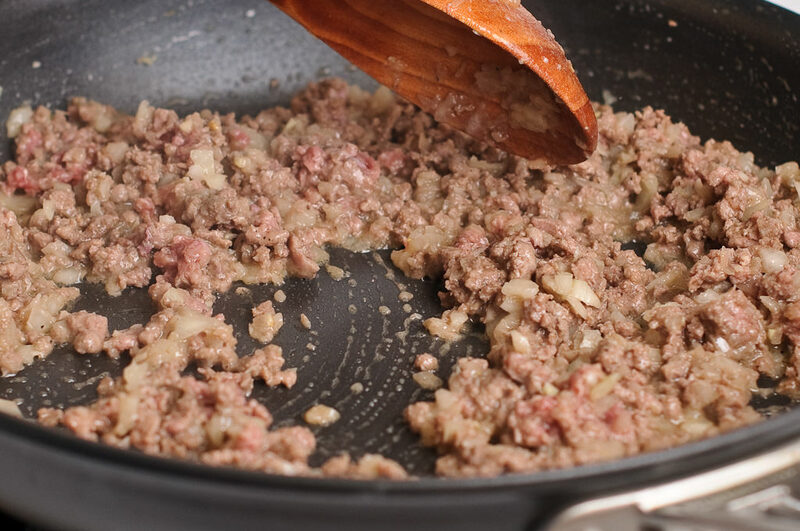 Heat the skillet in medium heat, melt the butter, addÂ chopped onions along with chopped garlic and add the ground beef.Â Add salt, black pepper and cumin. Saute for 4-5 minutes. Once done sauteing, move the skillet away from the oven top and let the meat mixture cool. 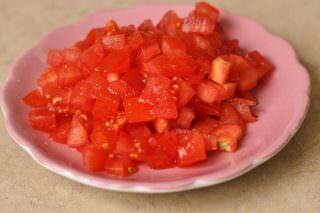 Cut the tomato in small cubes and keep aside until you need to use it. 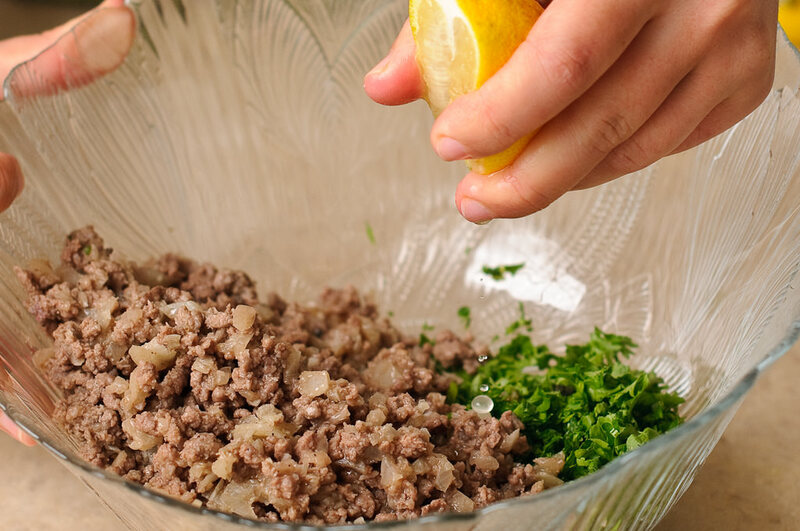 InÂ a medium bowl, mix the cooled meat mixture, chopped parsley, chopped mint and lemon juice. 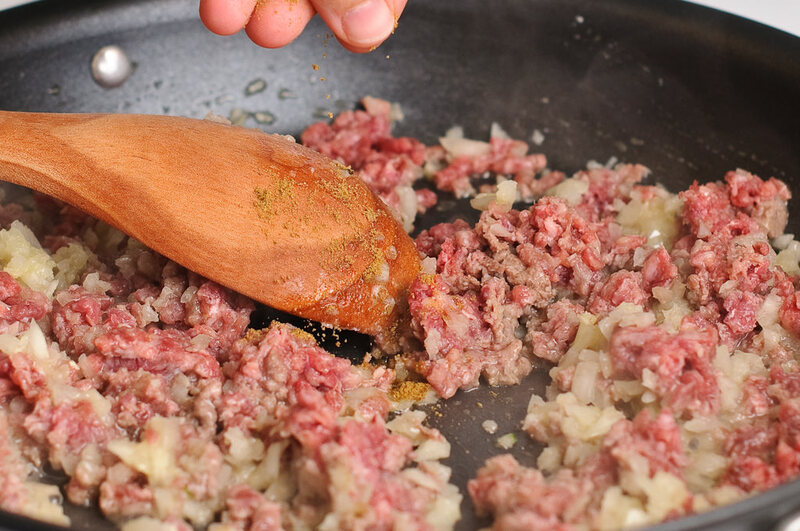 Mix ingredients well and set aside. Preheat oven at 400F. Once the dough is rested, it should double its previous size. Take out the dough to the floured surface, cut into two pieces. This way you will have two large Pides. Make round balls, set one aside and work with another one. 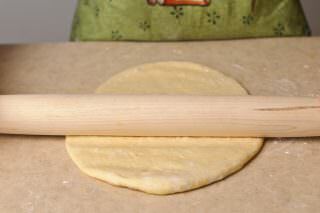 Using a rolling pin, roll an 18 inch, thin oval. Transfer the oval dough on the baking sheet and pat the dough with just a little bit of starch. 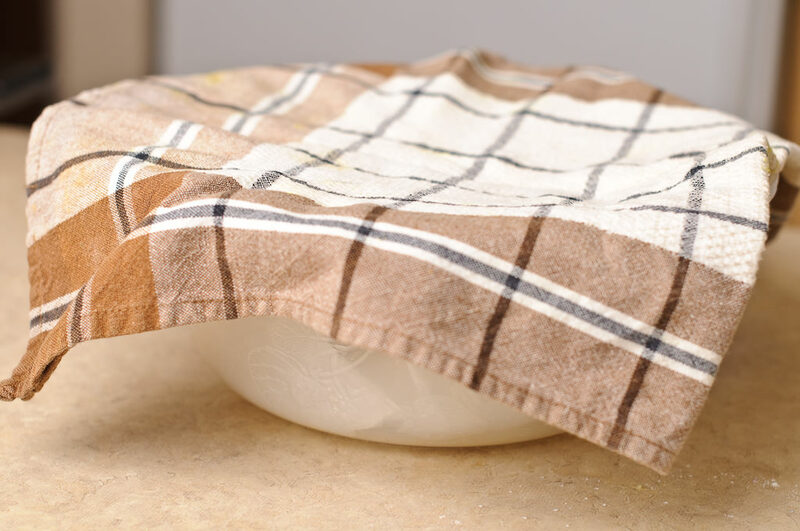 This will prevent the dough from getting soaked with the moisture of the filling. 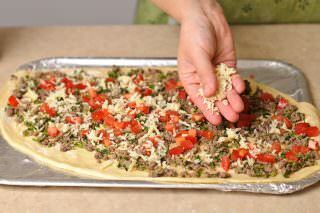 Evenly spread half of the meat topping on top of the dough. 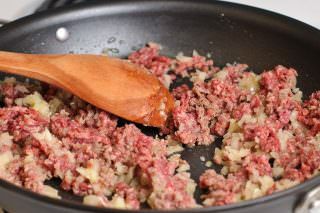 Place half of the cubed tomatoes on top of the meat topping and sprinkle half of the shredded mozzarella cheese on top. 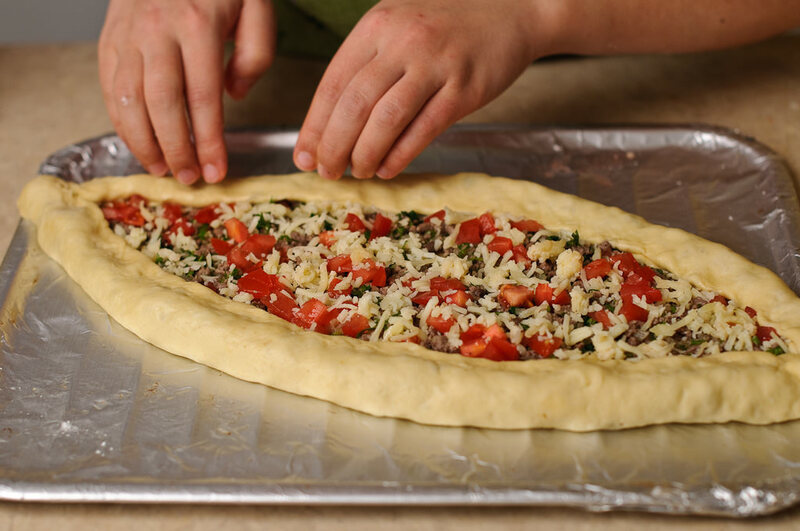 Fold the sides of the Pide, creating a boat-like shape. Beat one egg with a fork. Using a pastry brush, brush the sides of the Pide with the beaten egg. Slowly pour the remaining egg over the meat topping evenly. For the second Pide, I tried a different combination. I added mushrooms and chili peppers. 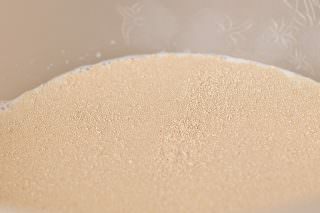 The second egg is used on the second remaining dough. 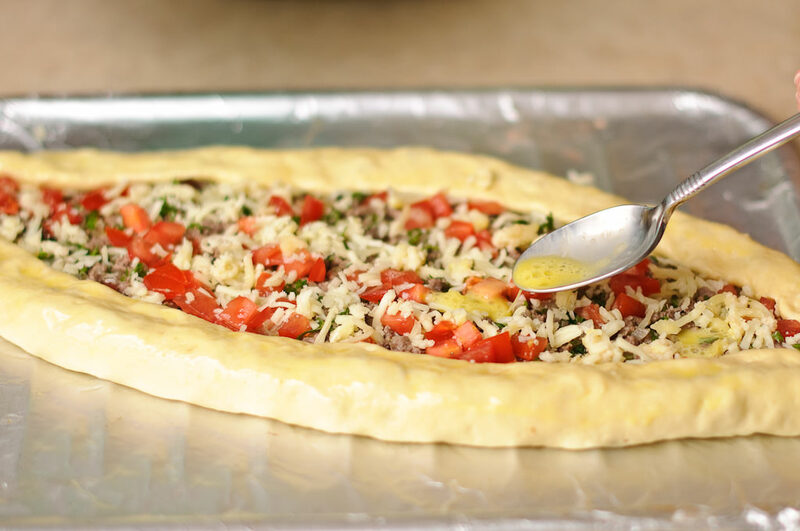 Place Pide in the oven and bake for about 25 minutes OR until golden brown. 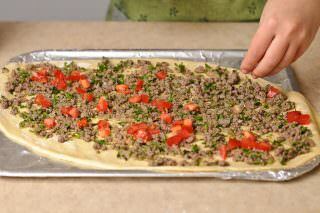 This is how the mushroom-topped Pide came out. If you have any questions, please leave them in the comment section below and I will do my best to answer them promptly. Bon Appetit! I´m Kamilla from TKL. I just wanted to take this chance and thank you for your wonderful work, you are a source of inspiration. Love your detail oriented way of presenting everything in an elegant way. You seem to have a good taste in pretty much everything, your work reflects this well. 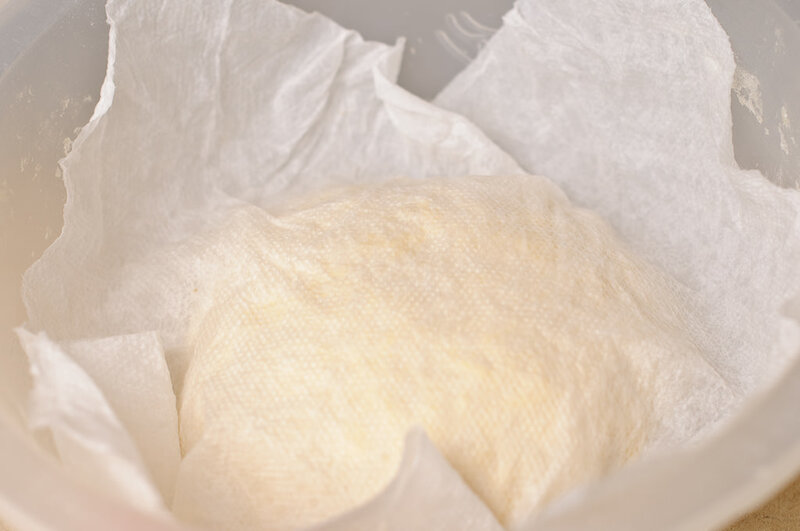 For years I looked for a site like yours, as I love cooking and baking, and never mananged to find anything sooooo good. Despite the fact that I make arabic, persian, uzbek and swedish/western dishes I still have my days when my head feels empty and I´m out of ideas, then YOU come into the picture ;-) with your bubbly and colorful ways of inspiring people. Love your work, keep it on, you rock girl. Kamillochka, you are spoiling me big time!!! :) Thank you very much for your kind words. I really appreciate the fact that my not so perfect cooking skills can inspire ladies like you. Thank you very much for vising out site!!!!! I also want to ask you if you have any recipes to spare :D I would love to try some of your recipes!!! I am so happy I came across this page. 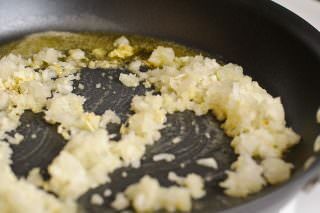 I am from Puerto Rico and love to cook recipes from around the world. 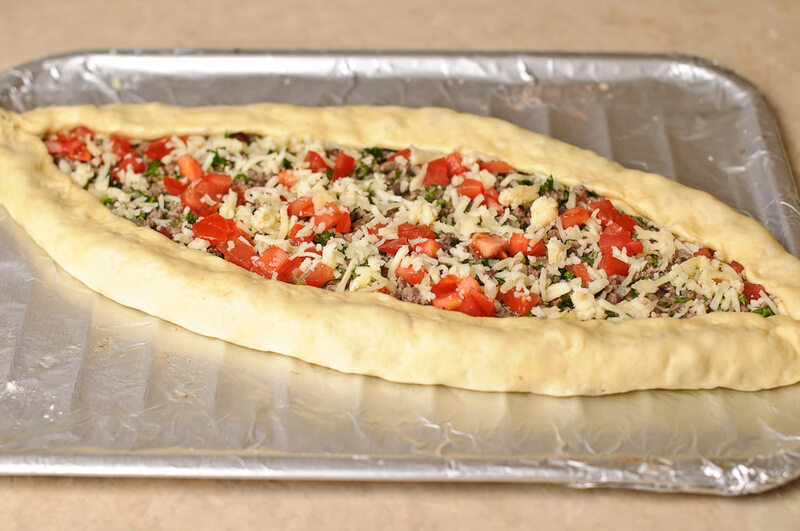 This Pide looks delicious. I hope to make it soon. God bless to you and all your followers. Awesome, Mercy! Have you tried it out yet? I have Pide for lunch menu today, too! 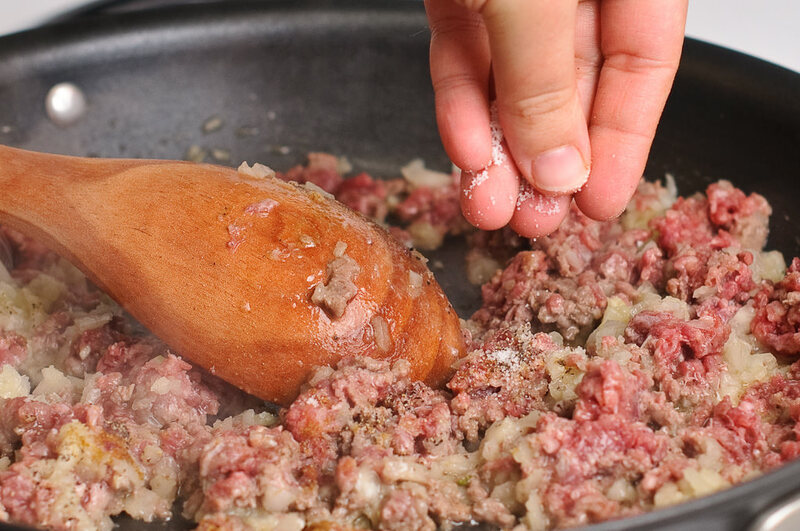 esimda turganda yozib qoyi, komoshshi gushtli piroginiyam step by step qoysen bolarkan, judayam bezproigryshniy recept, 10mattacha qildimov, har safar yaxshi chiqadi. Daaa, uniyam obyazatel’no boshqatdan rasmga olib, boshqatdan post qilaman keyingi hafta. Mangayam Komoni meat pie rooossaaa yoqadi. Wow. Your pides are stunning…absolutely stunning. I’m afraid of making this because I know the shape of it won’t look nearly as perfect as yours. However, since they look so fantastic (thanks to your awesome photos), I am still tempted to try this out. I will be bookmarking your recipe. Thank you for the excellent step-by-step photos! Memoria, do not be afraid :) I am sure you will rock it! I have a friend who tried it and had a shape of a big fat boat! You know what? I loved it :) It is her way of showing her love :P and it feeds more people :) Try it out. Let me know if you need any help. I knew I could count on you for great Turkish recipes! We loved the Lahmacun! Between the two of us, there were a lot left even though I made the full recipe! I will make sure I try this soon! merhaba! 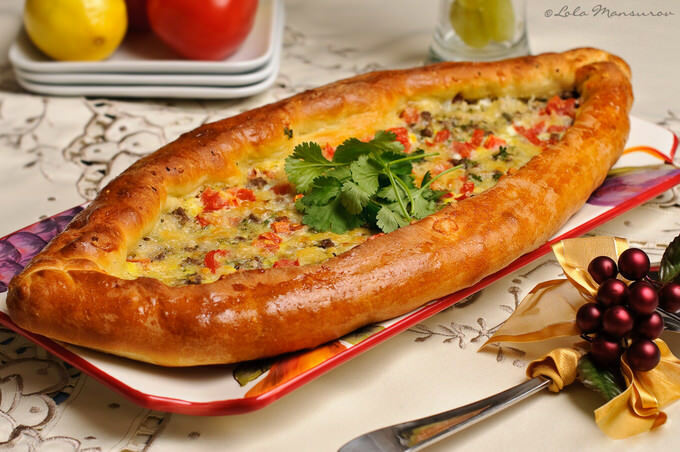 I am sure I will try the Pide!! I once had this in a Turkish stall in Singapore, I know I just have to make this one day soon! I wish you and your family a happy new year Lola! Thank you Mrs. Ergul :) I am sorry I am late with my new year wishes. My parents were visiting us for couple of weeks. I didn’t have much time to spare for internet (gladly so!). I hope you had a wonderful time on 31st. Last September I went to Turkey with a friend of mine, we ate lots of Pite during that 10 days. That was really happiness. After came home, till now, we miss Pide so much~ Thanks again. I am glad that you visited my blog! 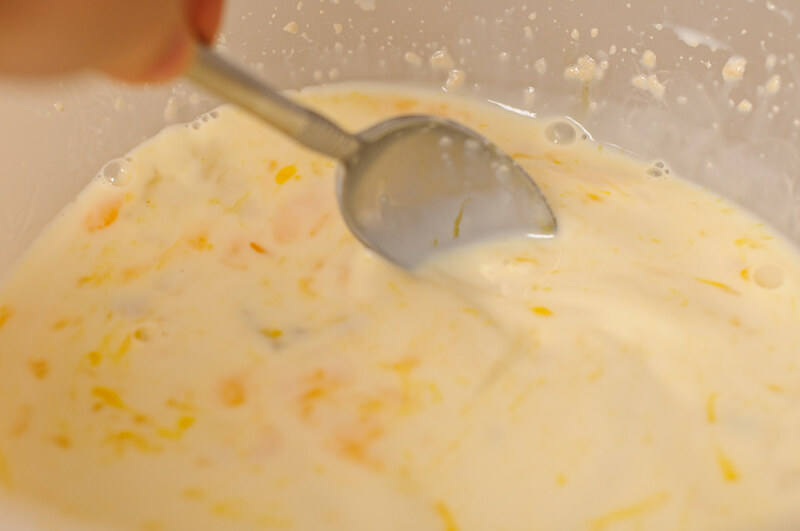 :) I am sure you will like this recipe, too!!!!! Hi Lola … that looks inviting. I’m not sure you can call that a pide though. 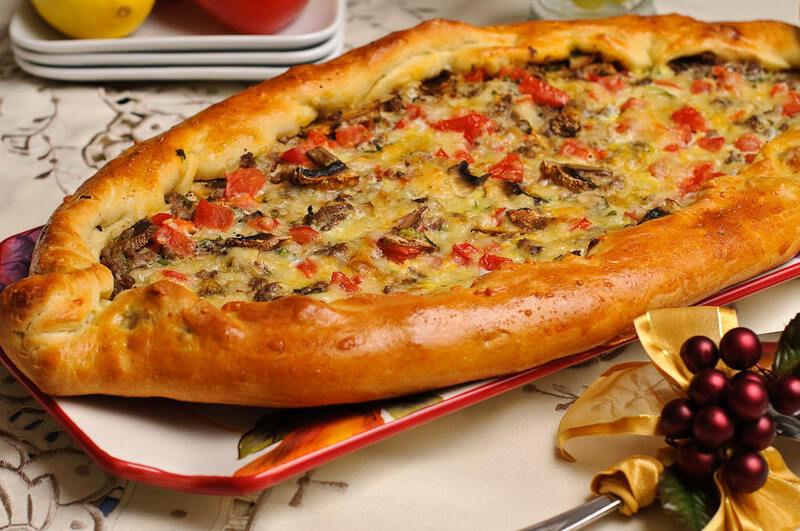 A pide in Turkey would be a plain naan like bread with no toppings. That is more of a lahmacun than a pide. 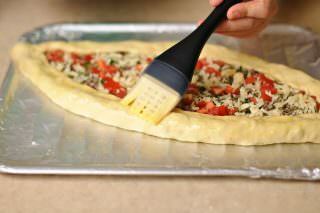 I also wish you would try the other variant of pide thats used for fillings like doner kebabs. Thanks again. Lahmacun is a different animal though. I do have recipe of lahmacun on the blog. But the technique and the taste differs tremendously. If I am not mistaken the ones they with kebab is called Lavash. But that is has been a while since I’ve been to Turkey. I may be a little wrong there. I would like to try this pied,but small in size. 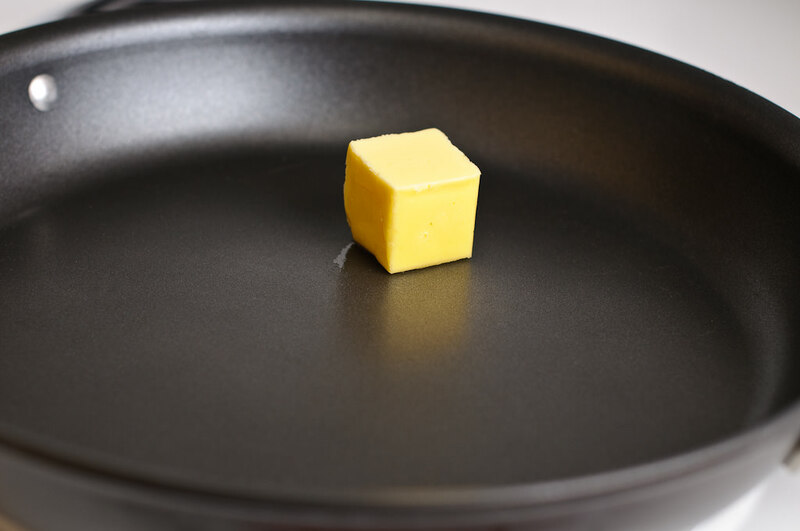 The size of a small tart(tartlet I mean). If so how long I have to bake & how much the temp should be? Dear Binc, temperature is not going to change. 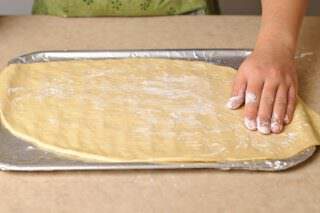 But baking length might differ slightly. Even then if you are going to place more than one ‘tarlette’ in the oven, it should take about the same time to get everything baked properly. Thank you so much for posting this! I’ve been searching for a good Pide recipe since I went to Turkey two years ago and I think this is it! I’ve been missing this food so much, I can’t wait to sink my teeth in. Thanks so much for your great step by step photos on making the pide. I have to admit I just read about this pizza like treat and had never before heard of it! What I like about it is that it seems there are more crunchy edges than a regular pizze and for me the best part of pizza are the bready crunchy edges. I have one question though and forgive me if I missed it in your tutorial. Did you bake the pide on any special baking sheet or stone? I see you placing it on what looks like a foil covered flat sheet but I don’t see mentioned if you transfered it to a special sheet or stone. Can conflour be used as the starch in this recipe? Hi, I ordered pide at an Anatolian restaurant in London yesterday for the first time. It was so great that I decided to make my own. Your recipe looks exactly the same as the dish that arrived at my table and so will be trying it this week. Thanks for posting! Hey! I tried your recipe a few days ago. Wonderful stuff! I haven’t been following your toppings though. Don’t have all of them and wanted to make something meat-less. I haven’t been making breads but even then the pide turned out quite good. Thank you! To conclude my Turkish cooking expedition, I invited four generations of family to come over and enjoy the cuisine. I’ve had pretty good luck with your recipes in the past so I chose this pida as an appetizer to serve along side a few other dishes that I have been practicing: abergine salatsi, Adana kebabs, and pilaf. Even though it was my first attempt at the pida, it ended up being everyone’s favorite dish. Just as you noted, I had to use slightly more flour (3.25 cups total using the scoop and level method) and I kneaded for approximately 5 minutes, until it was soft, smooth, elastic, and had a nice satin-sheen on the outside. Thankyou, thankyou, thankyou. 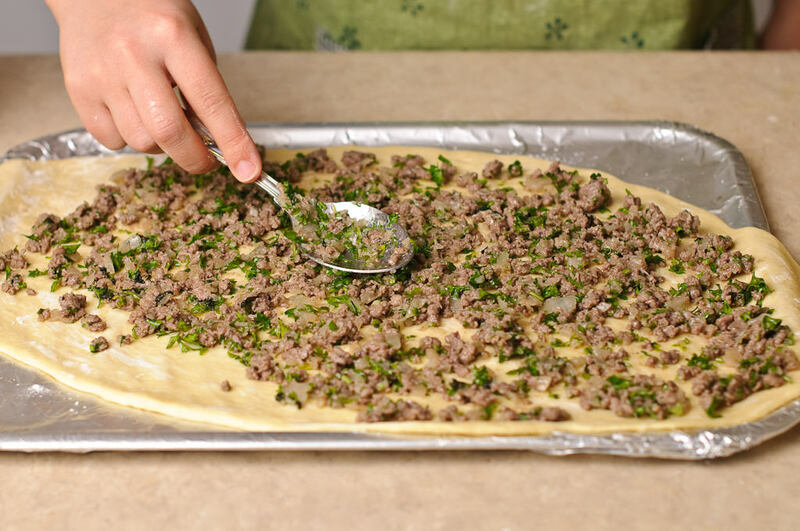 This is the first website i have found giving full description and pictures on how to cook turkish Pide. I want to also buy a good Turish cookery book do you have a favourite that you could recommend, or any other recipes that you could share with me via email. Having had a wonderful holiday with friends this year in Kalkan i am now having them over for a meal of turkish cuisine. (hopefully) !! It’s in the oven as I type, it smells amazing!! I had a tiny sample of the mixture before popping it in the oven too and, my goodness, it was so tasty! This is definately a recipe I will be making time and time again, thanks! I want to try this! Looks delicioussss!!! I’ve seen it with sucuk but this looks very good too. Hi, I’ve been craving this since i last visited turkey 2 years ago but i never thought it would be easy to make. i have been just in pide restaurant, and i ate two of them, now i am in a delicious dream. i insist on trying this taste. lovely. I hope it turned out very well! Hello Lola, Sorry got late to thank you on this wonderful recipe, tried this last week, o my – so delicious!! You have described everything so clearly, you made it look so easy. Thank you so much. 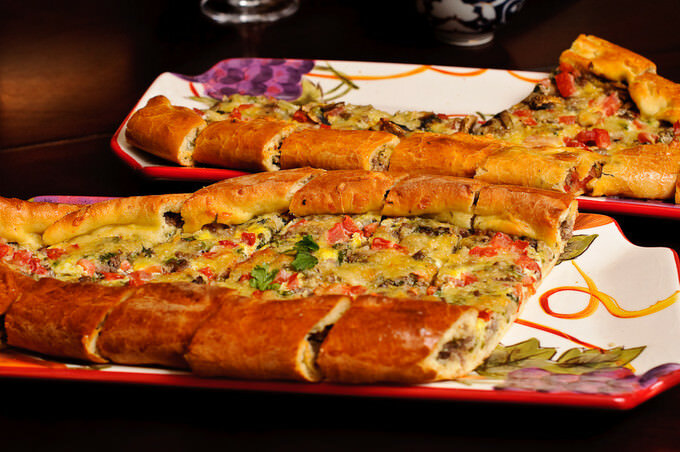 I used to eat pide in turkish restaurants here in Qatar where I live. I have eaten it as well when I visited Istambul. I searched until I found this recipe. Wow. Delicious. I will coock it for my family and friends when I go to my country for vacation. Thank you for sharing and especially for the very clear directions. 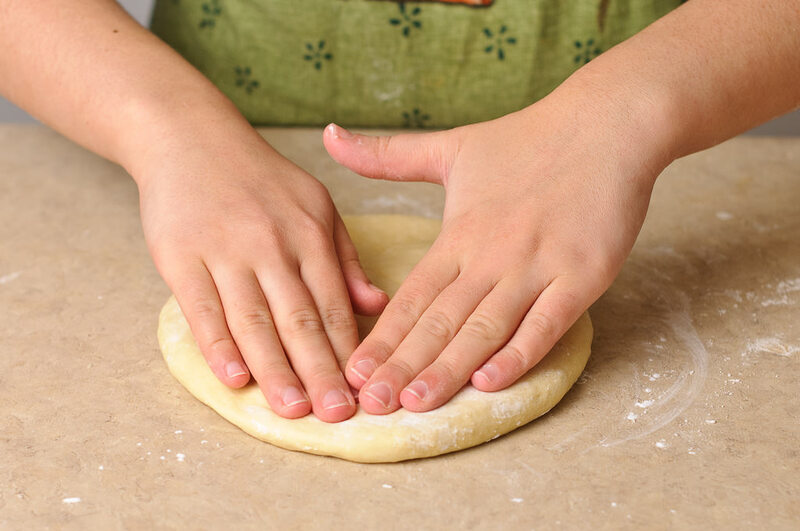 We have got an invitation to write a book chapter on the flat breads being prepared worldwide. For that we want to use the picture of Pide uploaded by your website. Please give your consent to do the same.